Essentially it includes the generation of feed stories followed by the limiting of viewers of those stories. As many avid followers of the social networking space know, the feed (also called the “stream”) has become one of the central components of online social activity. This is an interesting development in the social networking space and I'm curious how Facebook will decide to enforce this patent. Like other writers I hope this is defensive and that this doesn't become a major loss for the rest of the social web. There are numerous benefits to having an organized space, being more productive, less time searching for relevence, less clutter, increased attention, engagement and more control. I have many friends online across various sites and the ability to streamline the chaos provides many benefits. The sheer number of people that use Facebook is incredible, I believe that the majority of people I know are on the social network. I could probably count those not active on Facebook on one hand because the site has become core to social interaction and status. It's widely acknowledged that Facebook change site more than gypsies, but there are features available that with a little work will keep the experience efficient and rewarding. I use Lists and Filters to organise the newsfeed and this post summarises the process. I have had friends contact me as they wanted to introduce more control to the social network and I will make sure to point them in the direction of this resource. Arrived at the O2 Academy Brixton, full of excitement for the closing night of the Shockwaves NME Awards Tour in London. 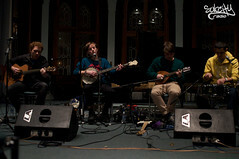 The Maccabees, Bombay Bicycle Club, Big Pink and Drums provided the live performances for a rapturous finale. Demand for tickets meant that I had to purchase mine from the touts that frequent the area around the O2 Academy. I had earlier managed to acquire a ticket from friends but due to weekend tube work affecting travel; I relented to the preying touts but at a reasonable price! I was disappointed to miss the performances from Big Pink and the Drums, especially as Big Pink's stage dived into the crowd during 'Dominos'. The Unreserved Circle ticket I had purchased, only postponed the inevitable entrance to the Standing Area, I found passage through with some persuasion. Anticipation for the remaining two acts was at fever pitch, Bombay Bicycle Club took to the stage and the place erupted. Personally I felt that BBC - I'm too cool - should have headlined because they're performance was energetic and inspiring. We managed to get covered in drink but I must shoulder some of the blame there.. I haven't managed to find their Set List online but Open House provided the biggest reaction of the night. Maybe I'm biased but considering how young they are, they have become an incredible talent. South London's Maccabees are a sharper, louder, and more confident live proposition these days, the headline status ends a fantastic 12 months. The band came up with the name by flicking through the Bible and picking out a random word, more innovative than being named after an Indian restaurant on King's Road! The set was amazing, Love You Better and No Kind Words proved to be the anthemic moments of an incredible evening. Edwyn Collins joined the Maccabees on stage for Rip It Up and everyone piled onto the stage at the end to close the tour. I recently attended the O2 Brixton Academy and wrote that I regarded it as one of London's leading music venues. I focused on the atmosphere, crowd participation and the area referred to as the mosh pit. Tonight, Brixton Academy had competition, my brothers band the Internal Skars were hosting an event at the local Social Club. The night was an emphatic success and defined as the best the band had experienced! A significant family representation, accompanied by partners who were there to participate in the proceedings. The proverbial roof being 'raised' was an understatement, much to the enthusiasm, energy and stampede of friends, family and fans. There's so much more depth to moshing, I have been introduced to a variety of different scenarios. The personal favourite being swung around, slight concern that I would ricochet around the venue but impressive regardless! The youngest sibling has much to learn about participation as he spectated and decided to leave early because it wasn't his scene. Seriously, I don't understand that approach but then I suppose he has time to acquire the credentials!!! I'm sure that you have seen the 'Keep it Safe. Keep it Hidden. Keep it Locked' commercials that provide useful advice on how best to keep your property safe. Basics like shutting windows and locking car doors even when you are only gone for a minute, or keeping your eye on your bag, can be all that it takes to prevent crime. There's another element involved now as through the increased popularity of location-based services and check-in games, we're advertising to the everyone when we're away from our homes. Please Rob Me has a humorous approach, providing a stream of updates from various location-based networks that shows when users check-in somewhere that is not their home. They state that the intention is not, and never has been, to have people burgled. The point is to raise awareness about this potentially dangerous location-based issue. South by Southwest (SXSW) is a music, film, and interactive conference and festival that takes place every spring in Austin, Texas. SXSW is one of the largest music festivals in the United States, with more than 1,400 performers playing in more than 80 venues around Austin over four days, in March. I really want need to attend SXSW but it remains a pipe dream at the moment. I'm interested in everything available, especially the SXSW® Music and Media Conference that showcases hundreds of musical acts from around the globe. Also available is the SXSW® Interactive that features five days of compelling presentations from the brightest minds in emerging technology, scores of exciting networking events hosted by industry leaders and an unbeatable line up of special programs showcasing the best new websites, video games and startup ideas the community has to offer. Finally there's the SXSW® Film Conference and Festival which provides a uniquely creative environment featuring the dynamic convergence of talent, smart audiences and industry heavyweights. The reason for this post and the background information is to provide readers with the following torrent/s that includes all the MP3 files publicly available on the SXSW website. Enjoy, I have been listening to the MP3's available and there are several artists that I feel have real potential! Last.fm is a popular Internet radio site for music, founded in 2002. Using a music recommendation system called "Audioscrobbler", Last.fm builds a detailed profile of each user's musical taste by recording details of the songs the user listens to, either from Internet radio stations, or the user's computer or many portable music devices. The graph shows exactly how many songs you have listened to throughout your membership of the service, picking out key milestones like your 5000th track or your 10,000th. You can compare your graph with that of your friends and a ‘cumulative’ mode shows how quickly you’re adding to your overall total of songs listened to. Last.fm is an impressive service and I have wrote several times about the benefits available to users. I rate being able to discover new and exciting artists and the event recommendations have provided many memorable nights recently. As Martin states in the post Last.fm are sitting on a lot of interesting listening data and I hope we see further innovations like this graph! February 14th represents the celebration of love and affection between intimate companions. According to Wikipedia, heart-shaped outline, doves, and the figure of the winged Cupid are symbols of modern Valentine's Day. I agree with Wikipedia that handwritten valentines have largely given way to mass-produced greeting cards but there's always room to enhance and introduce innovation. The gifts we exchanged were personal and the appreciation was rewarding! The reappearance of the too familiar disturbance in the force has been noted recently and has almost become a cliché. Rearing it's ugly head to the disappointment of those that desire greeting cards. John Lennon established while The Beatles were officially still together in 1969, that we should Give Peace A Chance. It's better to have a diplomatic approach because I got soul but I'm not a soldier! The journey home provided insight although no significant value, I appreciated the conversation but we shouldn't need intervention. Children were in good spirits and after meeting my partner I was relaxed after another week reached conclusion..
Facebook hit another milestone in their relentless push to own the Internets. They want as many people as possible to be able to access the social network and now boast that 100 million people actively use Facebook from their mobile devices every month. 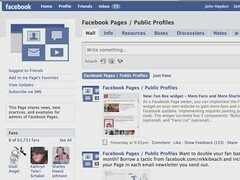 This makes Facebook Mobile bigger than Twitter! That's an incredible statistic and this comes less than six months after they announced 65 million people on Facebook Mobile. Providing support for all major device manufacturers including Nokia, Android, Windows Mobile, Sidekick, Blackberry, INQ, Sony Ericsson, Palm and the iPhone. This growth rate looks set to continue as Facebook adds more mobile users faster than it is adding web users! I'm always checking what's happening on the social network and with Push Notifications and the increased potential as a news reader; I'm hooked. I feel that the Events could be improved though because recommendations based on Pages and import habits could open many possibilities. Last.fm have a great system in place based on listening preferences and incorporating similar functionality would be a further lock-in fearture. What features would you like to see improved? Google: We believe that the social web works best when it works like the rest of the web — many sites linked together by simple open standards. Rather than launching with a one-off API, we see Buzz as a tremendous opportunity to work with the community to create and support open protocols for the next generation of social web apps and websites. To kick things off, Buzz is launching with support for public activity feeds and offers users the option to connect their favorite sites to their Buzz activity feed using open protocols. In the near future we plan to greatly expand the scope of these developer services, and we'd like you to be a part of that process. I'm a protagonist of the Internet, social networking and new media; I'll argue that the latest startup, service, innovation etc provides value until it becomes surplus to requirements. Google are always unveiling new toys for our digital consumption. The latest offering is Google Buzz (Light-Wave) and there is the expected clamour as everyone provides their opinion and details how the service can be improved! I rate the service as Google have applied the Friendfeed blueprint and released it to infinity and beyond the mainstream! 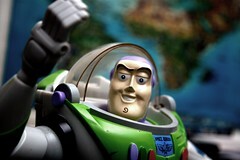 Are mainstream users ready for a product like Buzz? Probably not but innovation shouldn't have boundaries, I respect Google for releasing this product into the wild and not an opt-in feature within Labs. Google Buzz is a social networking and messaging tool designed to integrate into the company's web-based email program, Gmail. Users can share links, photos, videos, status messages and comments organized in "conversations" and visible in the user's inbox. To prevent being overwhelmed I applied a filter to remove the buzz notifications from my inbox which works. Some users are complaining about privacy but as Mark Zuckerberg stated recently 'The Age of Privacy is Over' so anyone upset should buzz off! 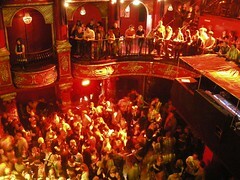 The Tesco Entertainment Album Chart Show features performances from new and established acts at London's Koko club in Camden. Tonight JLS, Mika and the Courteeners performed and we were there to experience the action. With a triple platinum selling debut number one album, two number one singles and two MOBOs. They may not have won X Factor but JLS have gone on to become the UK’s hottest band. In front of a majority Indie crowd, the foursome were always going to endure a fair amount of banter and we responded accordingly. Mimicking their dance routine and providing heart shaped signs with our hands, I felt that our appreciation was well received! I'm sure that when this event is shown on television that we are going to be the most active fans at the front of the stage area. Disappointed that the band opted to just lip-sync but I didn't even know they were making an appearance. Mika was next to perform songs from his album The Boy Who Knew Too Much. I really enjoyed his performance and I want the custom belt he taunted me with as he lept about the stage in an energetic manner. The evening ended with the Courteeners, I have read that lead singer Liam Fray personifies the typical Manchester front man. Although on this performance he was under par! I managed to clash with the video camera and our group were eventually told to calm down. Overall an impressive return for the Album Chart Show and I will be watching the shows on television and awaiting the invitation for the next installment! A bath is a plumbing fixture used for bathing. A bathtub is usually placed in a bathroom either as a stand-alone fixture or in conjunction with a shower. Yesterday evening I ventured out to exercise; the destination a local nightclub and the usual social networking but not from behind a computer screen. It only seems yesterday that we we're celebrating the beginning of the year, I can't believe that we're already in February! We've been constantly reminded about a certain birthday recently, today it arrived and I now have a seven year old son. The organisation for the weekend has been questionable as the children's mother wasn't able to confirm her plans, instead she allocated a short time in the afternoon. Not ideal but we wanted to make the most of the time we shared with him and opted for bowling. We have actively played Wii Sports on the Nintendo Wii over the festive period and were quietly confident that form would continue! We were mislead although my brother managed to play consistently and set a decent score. The afternoon was great fun as everyone was there to participate and my son enjoyed himself. He lost interest towards the end slightly but I suspect that's because we had consumed the contents of almost every helium balloon that were distributed across the venue for decoration. After the two games we descended into the Arcade area and although we didn't play billiards/pool we were eventually covered in chalk and resembled Noddy and Friends as we made our way through the exit! 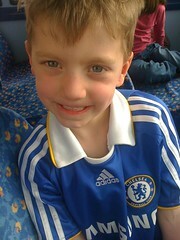 Happy birthday Boy and looking forward to attending a Chelsea Football Club home match soon!! The O2 Brixton Academy, is one of London's leading music venues, voted venue of the year twelve times since 1994 in the annual NME Awards. Attracting big names the venue has seen many famous bands perform there. In 2008; N*E*R*D performed and I was there and thought that they were immense. The intimate venue really captures the atmosphere, providing electric sound and there's always great crowd participation! Tonight I travelled to the O2 Brixton Academy to watch Jamie T & The Pacemakers perform. The support slot was provided by Chester P; I'm unfamiliar with his material but he managed to set the tempo well for the main event. 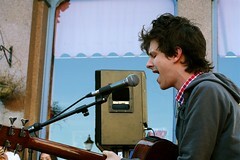 After what felt like an age, the lights dimmed and Jamie T took to the stage. Stood alone, basked in the spotlight and with the admiration from the vocal crowd he played a poignant rendition of St Christopher, before being joined by The Pacemakers. The band then launched into latest single The Man’s Machine, and then favourites So Lonely Was The Ballad, Salvador, If You Got The Money and Back In The Game. We occupied the area in front of the stage which is typically referred to as the mosh pit. Throughout the performance the mosh pit became an invigorating wave of carnage as the crowd aggressively pushed and slammed into each other. People attempted to crowd surf and we managed to throw someone a fair distance, although the receiving fans were unable to return the serve! Game, Set, Match!! The onslaught continued onstage with Operation and Northern Line, I was impressed with my partner who was able to hold her own amid the surging crowds. The encore consisted of Chaka Demus, Spider’s Web and Sticks ‘n’ Stones, I wasn't able to obtain the Set list so apologies if the track listings aren't complete. Overall I really enjoyed the evening and was relieved to return to the car and not find a parking ticket; due to the appetite of the machine! I aim to return to the O2 Brixton Academy for the Shockwaves NME Awards Tour later this month and would welcome a similar experience!! 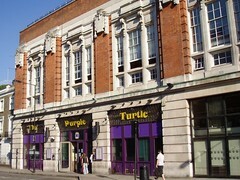 The Purple Turtle is a venue situated in the heart of London’s music scene, located near Mornington Crescent station and in close proximity to Koko, showcasing some of the most exciting new indie and rock acts. I travelled there this evening to catch my brother's band the Internal Skars. He rarely tells us where he is playing but he was hyped for this performance, I have had several eventful nights in Camden recently and was full of anticipation. Facebook is a publishing, syndication and subscription platform where the interests of the reader, the publisher and the platform provider are all in sync. That's powerful. Subscription through Facebook may be sterile, hermetically sealed and controlled by one too-powerful communication company but it works. Facebook clearly has an opportunity to become the subscription mechanism of choice for hundreds of millions of readers and for millions of publishing organizations. That's a good place for any company to be. I'm subscribed to 200 pages on Facebook and would be subscribed to more if it were easier to locate the Pages associated with the feeds within Google Reader. I'm not interested in the "quotes" Pages because I don't feel they add any significant value but I subscribe to many artists, agencies and news outlets. The value they provide has many benefits because I'm able to communicate directly with Pages, I receive updates where I'm most active, popular news and tour announcements. Brands should maintain and regularly update Pages because with 400 million users; Facebook is kind of a big deal on the Internet! What are your thoughts?! Miike Snow are a Swedish electro-indie act, who formed in 2007. The band consists of Andrew Wyatt, and the producing team of Christian Karlsson and Pontus Winnberg. Tonight I travelled to The Scala, Kings Cross for the NME Awards Show featuring Wolf Gang, Theophilus London and Miike Snow with those influenced by peer pressure. The night actually started at London Bridge station, the rendezvous point, although when did McDonalds start serving Vodka?! Eventually we arrived at Kings Cross and my partner and her sister made their entrance; I had to rely on the powers of persuasion and the preying touts. I succeeded and joined them before the opening act! We occupied the bar area for the Wolf Gang set but took position when Theophilus London began his performance. He was a likable character and got the crowd behind him even with technical issues that affected the microphone. Wasn't too sure about the provocative dance moves but the female he pulled from the crowd appeared to be impressed! Eventually Miike Myers Snow filtered onto the stage like a scene from Halloween wearing white face masks and bathed in laser light. The set started with a slow momentum; Cult Logic building onto Burial before the more upbeat Black & Blue. The masks were then removed and it was down to business. I'm familiar with their album and was impressed with the sound quality and innovative mixing that at times was exceptional. A Horse Is Not A Home was followed by the powerful Silvia which captivated the crowd. Plastic Jungle was followed by Sans Soleil before the favourite Animal got everyone involved! The night finished with an extended version of In Search Of and closed an inspiring performance. I even managed to secure the setlist, again!